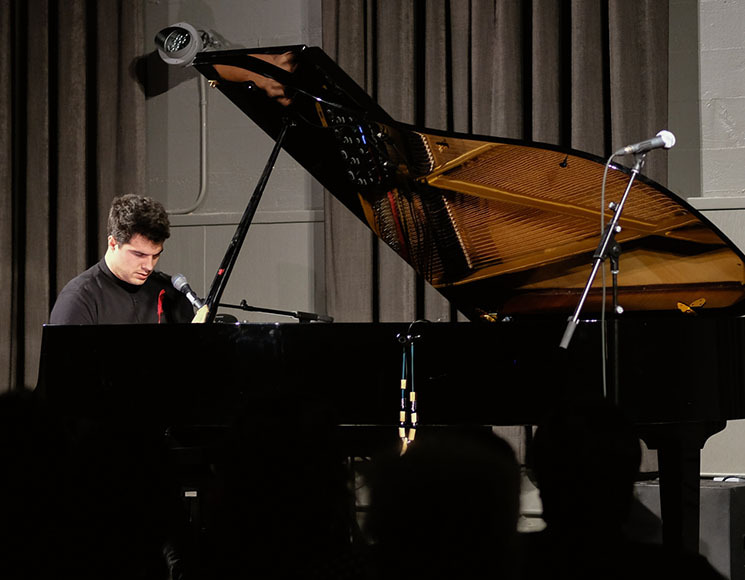 As the world knows, Jeremy Dutcher took home the Polaris Music Prize in 2018 for Wolastoqiyik Lintuwakonawa, an album created after the Tobique First Nation composer and classically trained operatic tenor spent five years intensively studying and transcribing wax-cylinder recordings of Wolastoqiyik music that were made at the turn of the last century. He witnessed a lot of beauty in those archives, and he considered it his job to reflect that beauty back into the community. Today, less than a hundred people still fluently speak the Wolastoqiyik language. As such, Dutcher is doing a great service to culture on many levels: preserving language, revitalizing traditional music to exist with the people in modern times, and, when it comes down to it, restoring the people themselves. As his mentor Maggie Paul said in an interview he conducted, part of which he played during the show, "When you bring the songs back, you gonna bring the dances back, you gonna bring the people back, you bring everything back." While Dutcher has come to know some rather large stages, having performed at the Polaris gala and set to play at the Juno Awards in mid-March, this Victoria performance was about as intimate as it gets. The Baumann Centre only holds about 150 people and it was filled to capacity. Before he took the stage, CBC host and proud member of the Métis Nation of Victoria, Shelagh Rogers, gave Dutcher a heartwarming introduction. She said, quite accurately, "We are so lucky to have him in our lifetime, in our ears, in our hearts, in our spirits, in our souls because truly he is medicine for our wounded country." Being that it was International Women's Day, it made even more sense for the all-female Answer Drum Group to open the show by performing a song for him, which they did so after presenting Dutcher with a devil's club necklace and wrapping him in a blanket, a thin one because he likes to pack light. With a red feather on his heart, white sneakers on his feet, and black jeans with a matching button-up shirt in between, Dutcher looked completely at ease behind that piano. His performance was perhaps a little more subdued than the one heard on his award-winning album, more minimal as he primarily played on the piano and looped his voice, utilizing sparse samples of his source material. Lacking the studio bluster meant greater focus on his piano work, which was elegant and emotive, yet ultimately playful. Though he looked like a fresh-faced college kid, his voice was as powerful as any of the Three Tenors, a commanding presence even at a sigh. He sang from a place deep within, a place of undying love, of honest respect, and of social responsibility. Demonstrating responsibility in full, "Sakomawit" is a song about the swearing in of a new chief. Its lyrics include a phrase that means, "When you lead us, you need to think of all of us, especially those not yet born, because those are the ones who your decisions will affect." It's the song he plans to sing at the Junos, a song he wrote when Justin Trudeau took power, though JT may not like it all that much in the current context. As he introduced the song, Dutcher reflected, "I think we were all really hopeful; a renewed nation-to-nation relationship. You know, a renewed relationship doesn't look like investing in pipelines and trying to force it through unceded territories. It doesn't look like a lot of things, but I hope it can look like this song, because this is a call for accountability, to say that our communities are watching you. So anyway, this one is for Justin." Arguably the most impressive moment of the set came when his dear friend, soprano Teiya Kasahara, helped bring "Pomok naka Poktoinskwes" to life, as she did on the studio recording. The title means fisher and the water spirit, so he declared himself to be the fisher, and she agreed to be the water spirit. Her voice was every bit as mind-blowing as his, yet he stole the climax of the song, he stood up and sang into his piano, his voice resonating the strings in a natural echo. Outside of the piano, Dutcher performed a couple songs in a traditional fashion. His encore was an honour song performed with only a buffalo hand drum that was given to him at Treaty 1 in Winnipeg, while another simply featured a small shaker that he made himself. Apparently, at an earlier show in Edmonton, the shaker actually split and shot dried corn at the audience, so he half-jokingly warned the Victoria crowd in advance, in the hopes that if it happened again, they would save the corn and give it back to him for future repair. There were several moments of humour throughout the set. Whenever it hit him, Dutcher laughed with his whole body, tilting his head back to let out huge belly laughs. As he said early on, it's called "playing" music for a reason. His overall mission may be serious, but he's clearly having fun and loving life. After all, if you don't make this stuff fun, it isn't going to resonate. Clearly, Dutcher is resonating. You could have heard a pin drop throughout his set as the audience was thoroughly mesmerized, reciprocating all the love and respect that he showed us. Truly, we are blessed to have Dutcher spreading the good word.